This Long Beach Blue Metallic BMW X5 M comes with a few aftermarket aero touches. Designed and engineered by IND, the carbon fiber front lip spoiler adds a touch of aggressiveness to the already sporty and dynamic front fascia of the powerful M SUV. The carbon fiber construction of the spoiler means it’s lightweight while allowing the lumbering SUV to attain better aerodynamic properties. 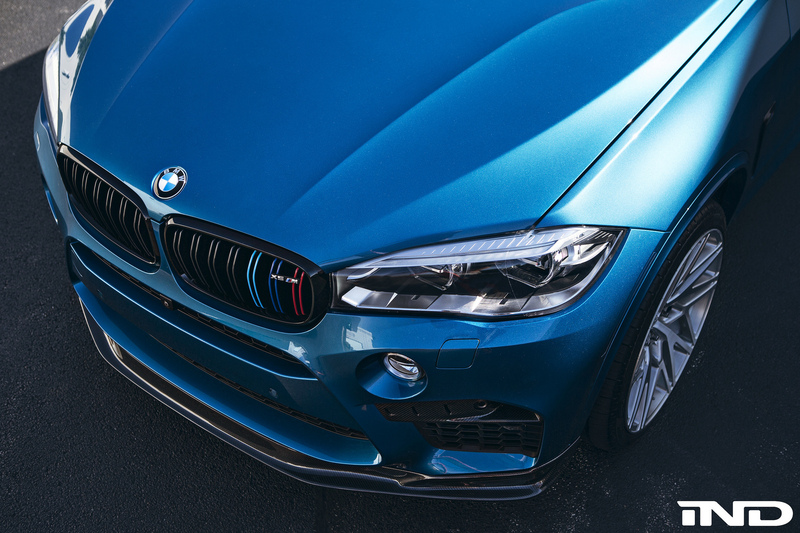 The front-end also stands out with the blacked out kidney grille which was further customized with the iconic ///M colors on the slats. Next on the upgrade list were a set of aftermarket wheels from Velos Designwerks. The contemporary design and futuristic spoke layout – along with the brushed aluminum finish – ensure that this X5 M will not go unnoticed anywhere its driver takes it. With the vehicle lowered by a few millimeters, the stance and driving dynamics of the X5 M have been improved as well. 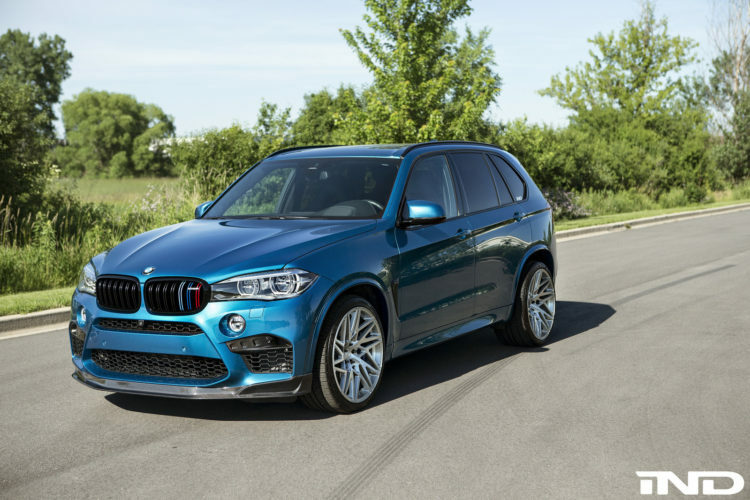 Starting at $99,795 for the base model, the BMW X5 M is a performance vehicle that ticks all the boxes. It offers plenty of headroom and legroom, a decent sized boot and performance numbers equal to some high-performance sedans. The monster truck is powered by a 4.4 liter V8 TwinPower Turbo engine delivering 575 horsepower and 553 lb-ft of torque. 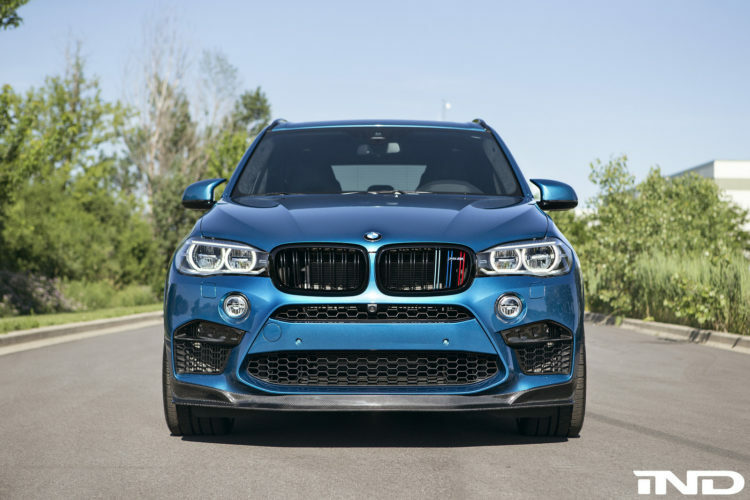 The engine allows the all-wheel drive BMW X5 M to accelerate from 0-62mph (0-100km/h) in 4.0 seconds while reaching an electronically limited top speed of 155mph (250km/h). For more photos, please visit the gallery below.